My life was full and busy. I was a stay-at-home mother of two teen-aged daughters. My life was wonderful and hectic. If it weren’t for my at-a-glance calendar I would have been lost. I was a board member of the local elementary school, a 4-H leader, president of the PTA, and a member of a local athletic booster club for young ladies at a new high school. When I wasn’t busy with community events I was playing Bunco with a group of women that I had met through PTA, having lunch with girlfriends, sewing craft projects, and flying for shopping trips with a girlfriend who had her own plane and pilot’s license. I was also the help mate to my husband in taking care of property we owned. That should have been enough for me but my daughters were finishing high school and starting college. I had been a secretary before deciding after my younger daughter was born that I wanted to be a stay-at-home mom. I wanted to return to work and to gain the independence of once again being paid for something I did. It was a tough decision to decide what I should do. My husband taught school and had summers off. That was our time to do whatever we wanted. The job had to have a similar schedule to his if I was to return to work. We agreed that I should look for a position as a school secretary or other clerical position in a school where I would have the same or similar schedule. Then the call came—the beginning of the end. I had been selected for a position in a school office as the school secretary. I was scheduled to start work on May 1, 1999. I visited the office a few days before that, wanting to see what the office looked like and where my desk would be. My coworker told me that she often burned candles at her desk because the office had a “smell” to it. I was so excited to start working that I never thought to ask about where the smell came from or what might be causing it. Instead I asked her where she had purchased her candle and what scent it was. As soon as I left the office, I went and bought the same candle so the scents wouldn’t compete with each other. What I didn’t know was the smell and its source would lead to my downfall and a life where I would be a prisoner of unexplainable and severe allergies and sensitivities. In this new life, depression became my constant daily companion as I tried to cope with the stress of being sick and struggling to live within my new found limitations. I also dealt with a lot of guilt over being sick. In less than a year, I had taken off twice for surgeries and my coworker was left to not only deal with her duties but mine as well. 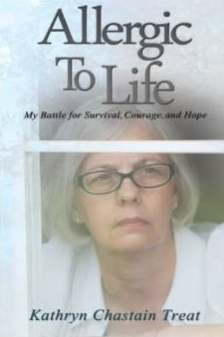 ALLERGIC TO LIFE: My Battle for Survival, Courage, and Hope was written because I felt the need to share my story. My hope is that others will become more aware of the effects of mold and what life is like for me and many others suffering from severe sensitivities to chemicals as well as allergies to foods and molds. It is my hope that others will recognize the dangers of all the chemicals lurking in their everyday lives. Finally, it is my hope those suffering will realize they are not alone in their battle.